I was trying to scroll through the UA Carousel thread but it was loads of posts with contradictory statements. Where exactly do we stand on all of our coaches? I am tracking Enos left, Gattis left, Key left, and Locksley left. Those are all offense guys, did we lose a couple defensive guys to bring Sunseri back and bring in Freddie Roach too? We restructuring the whole staff? You have really missed out on a lotta "fun!" We've had several posters seemingly on the edge...but stability seems to be reestablished in the Bama Universe. It has been quite exciting with all the supposed insider information. Seems to me that CNS is bringing in the old guard, no matter the personnel cost, for one last 3-5 year run. I'm more excited than I was last week, to be sure. But there are rumors of a coach being added after spring practice. I just assumed that might be Bo since his clause ends in April. Many, many thanks for stepping in here and clarifying a mounting mess. I couldn't keep track of who was coming, going, or staying. This is a great clarification. I am hopeful once the show cause expires he will then be hired. Seems that is what Cecil is hinting at. Bo Davis made a big mistake and has paid the price. I think he would be a very valuable addition to the staff. My guess if Lake comes then Kool or Scott is gonna leave and Golding will be the co-DC. This year with the new assistant allowed we decided to allow our OC full reigns over the offense and have one coach have a dual role in Banks. I think this year you’ll have the OC have a dual role and we will allow the DC to have full reigns over the defense. I think with the complexity of our defense that makes the most sense. Note the change to the first post about Roach. I have a love/hate relationship with coaching searches. The "hate" part comes in when you have to balance when to say something against letting it go all the way through to an official announcement. Proactive/reactive, etc. As I edited the first post to say, I wonder if Roach joining the staff is dependent on some kind of decision from Lake. 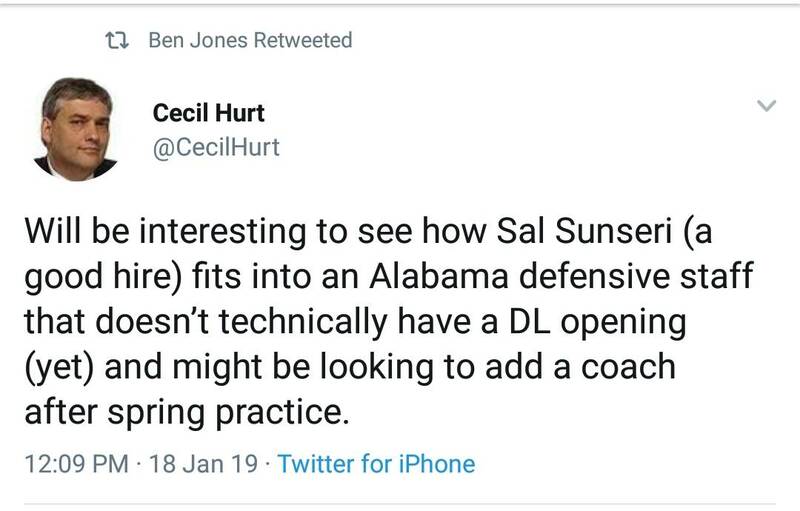 And obviously, Cecil is talking about Bo Davis rejoining the staff at some point. The issue there is I believe he's still under a show-cause. Cecil may be referring to the approximate time his show-cause expires. And then you have to get it by compliance (and maybe the SEC, going off how Sankey pressured schools over the Hugh Freeze situation). Also, any words on butch Jones being off the field assistant and lance Taylor as wr coach? Sal Sunseri, Kyle Flood and Freddie Roach (not so fast my friend) all appear to be joining the staff. Assuming Butch Jones is getting an on-field job, that would make him the new WR coach, and Steve Sarkisian would be the QB/OC coach. Kyle Flood would coach OL. Not sure how Roach and Sunseri would divide their duties. Unless Craig Kuligowski moves on, Alabama will flip one of its assistant slots from offense to defense. EDIT: The Roach hiring has yet to go through, and I'm going to pull that back for right now until I can re-confirm with the person that I talked to about it. I'm openly wondering right now whether Lake has to give a final yes/no first. I asked several folks I know who know Freddie well and he has given no indication he will be on the staff. If it were close, they would know probably before 99%. I would love to see him on the staff. and even more frustrating are all these tweets. Half the time I have no idea who these people are that are tweeting. Are these people that actually know something or is it just some random idiot with a twitter account?